ORANGE BIKES. LAPIERRE BIKES. COMMENCAL BIKES. The 2019 Transition Bikes are here and this Patrol GX is sure to be the best seller. We have the bikes in store now and ready to ship. The Orange Stage 5 RS. Forget everything you thought you knew about bigger-wheeled bikes: the Stage 5 is here. Designed to go further and faster whatever the terrain, this bike signals a new generation of trail-loving 29ers where nothing’s off limits and everything goes. 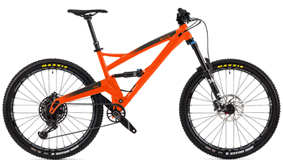 Oranges best selling bike and our best selling Orange Bike. The Five Pro is the perfect UK all rounder. 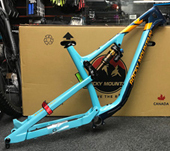 The Mondraker Foxy Carbon RR now has 150mm travel front and rear to make it a real trail weapon. This is the most complete bike in the Mondraker lineup. A true all-rounder. The Orbea Rallon is the bike of the moment and the M Team is the pick of the bunch in our opinion. Cracking value for money and the reviews to back it up. The Orange Alpine 6 RS uses single chainring 1x12 set-up with a dropper post as standard equipment, this one's built for the tough guys. It's fast, big-travel trail bike and the perfect Enduro tool.